These efforts can take different organizations in different directions. For example, if your organization creates physical widgets on a production line, or if your staff are considered ‘knowledge workers’ creating products which are essentially ‘information assets’. Either way ‘knowledge management’ becomes more important in this economic climate. If you have to let people go, how do you ensure that vitally important knowledge does not leave with them? However ‘knowledge management’ means a lot of different things to different people, and indeed is often used interchangeably with Information Management. This article examines where content management fits within a knowledge management (or managing knowledge) context. It treats all varieties of content management e.g. web content management, document management or even records management as discrete sub-sets of ‘Enterprise Content Management’ (ECM). This is done to keep the discussion simpler, but at the strategic level the principles are the same, whatever the peculiarities of a specific type of content. 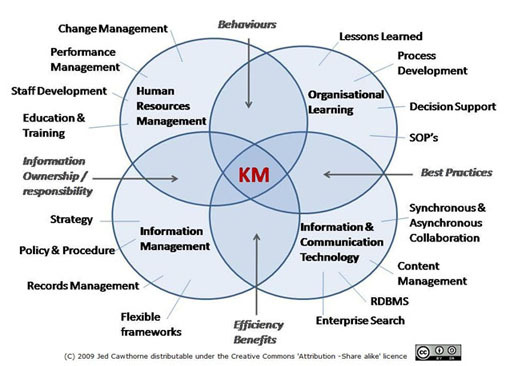 Knowledge Management (KM) comprises a range of practices used in an organization to identify, create, represent, distribute and enable adoption of insights and experiences. Such insights and experiences comprise knowledge, either embodied in individuals or embedded in organization processes or practice. This definition puts the emphasis on information management as a discipline and does not actually mention the ICT tools which enable and facilitate information management. However, many models and definitions of KM suggest that a solid foundation of good information management is required, so let us examine the definition of information management. Information management (IM) is the collection and management of information from one or more sources and the distribution of that information to one or more audiences. This sometimes involves those who have a stake in, or a right to that information. Management means the organization of and control over the structure, processing and delivery of information. This is a simplistic but non-contentious definition of information management. In North America, many organizations are now considered to be in the class of organizations often labelled as ‘information rich’; where many of the staff are also often labelled as ‘information workers’ or ‘knowledge workers’. In other words, the main outputs of these organizations are informational products such as reports and other official documents, as opposed to physical widgets. For other organizations, primarily those in manufacturing, the outputs may include physical artifacts, however they also still include knowledge or information ‘assets’. Structured Information: The types of information that fit well into the structured environment of rows and columns in a database. For example this includes the types of information that is presented via Enterprise Resource Planning (ERP), Customer Relationship Manager (CRM) or Human Resources Management (HRM) applications. Unstructured Information: The types of information that do not fit will into rows and columns. Such information includes office documents, audio files, videos, and other ‘complex’ assets. Enterprise Content Management (ECM) is the strategies, methods and tools used to capture, manage, store, preserve, and deliver content and documents related to organizational processes. ECM tools and strategies allow the management of an organization's unstructured information, wherever that information exists. For more information on Enterprise Content Management (ECM), read "CMS or ECM - What is the difference?" Note that this definition puts equal emphasis on strategies, methods and tools. In other words it's not just about content management systems and software, but all the strategic planning and management activities, policy and procedure development etc. that goes with the implementation of a specific content management system. The ‘capture’ element of the ECM definition can be replaced or supplemented with ‘creation’ and as knowledge workers often collaborate on the creation of content items or assets, collaboration strategies and tools are often also included under the umbrella of the ECM definition. ECM is often a complex strategy to implement, due to the nature of the various categories of unstructured information to be managed and the ever increasing frequency of the creation of information, leading to broad scoped initiatives that impact upon large numbers of staff, and thus large numbers of potential users of any ECM systems. Therefore Change Management is often even more important in a content management implentation than it is for ERP or CRM implementation. 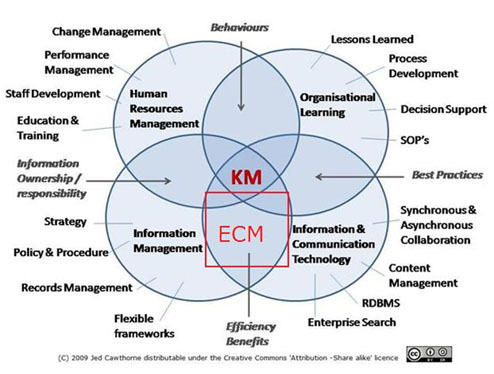 So where does ECM fit into this illustrative depiction of KM? It is now a good time to be examining whether your organizational information management environment is doing all it can to help rather than hinder your workforce, to enable your management of extremely valuable information assets and knowledge. To learn more about content management and planning, read this article by Toby Ward "Content Management Proves Costly without Planning." Prescient Digital Media can supply expertise in strategy, planning and governance of intranets, in assessing your content management solutions, and in developing requirements and choosing technology for new content management initiatives. For more information on The Intranet Blueprint © 2012 please contact us directly for more information on how to transform your intranet into a high-value employee & business system.